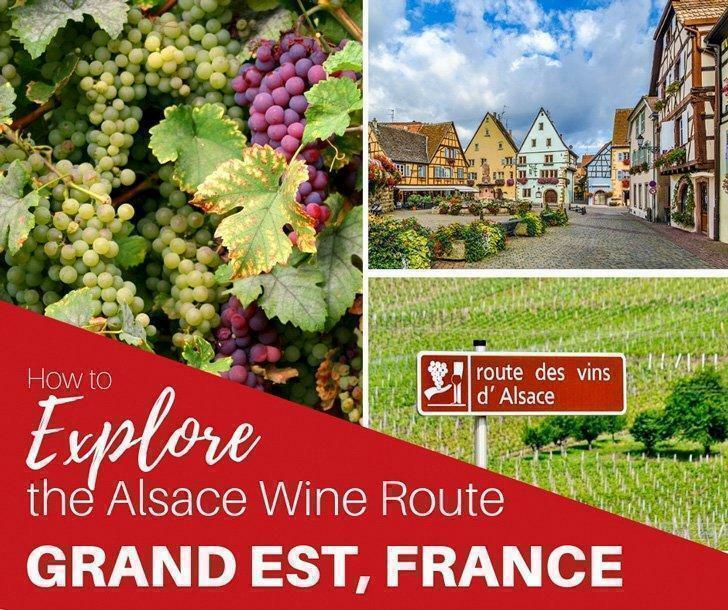 Catherine shares how to explore the Alsace Wine Route by car including the best cities and villages to visit along the way and the best accommodations on the Alsace Wine Route, in Grand Est, France. If your goal is to have a relaxing vacation, a slow trip through wine country is hard to beat. The Alsace Wine Route, located in a breathtaking region of France, offers travellers an unforgettable experience, filled with rolling hills, stunning mountain views, lush vineyards, and, of course, magnificent wines. Plus, many of the towns have an innate historical charm, blending architectures from multiple centuries and reflecting a few different cultures, creating an ambiance you won’t find anywhere else. 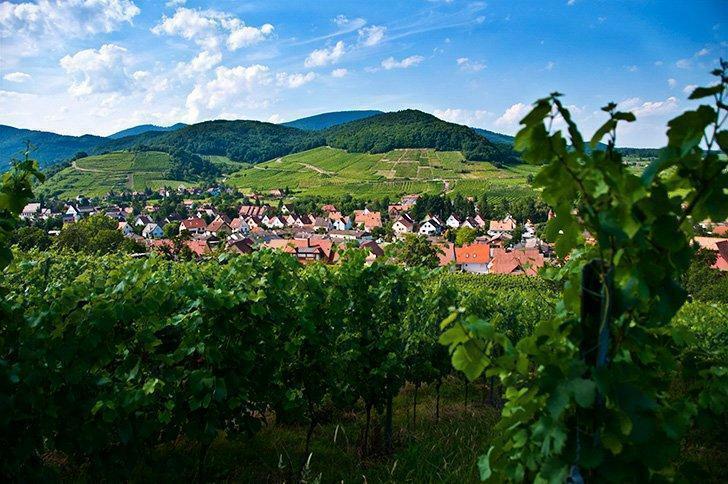 Ultimately, if a leisurely stroll accompanied by amazing wine sounds ideal, the Alsace Wine Route is a must-see. 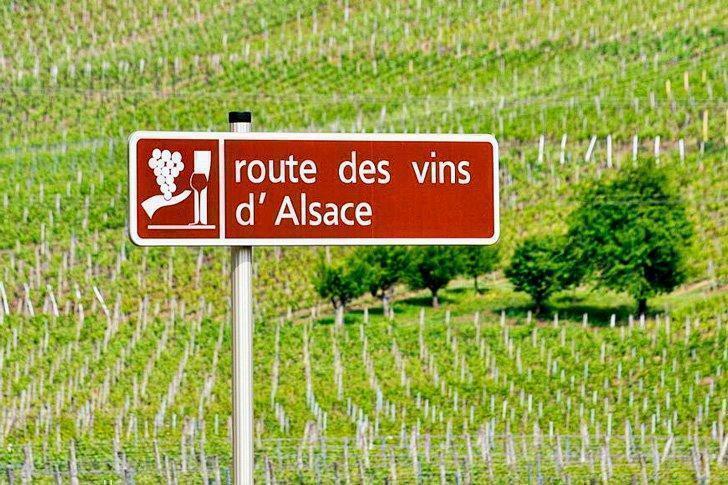 Where is the Alsace Wine Route? Why Explore the Alsace Wine Route by Car? The Alsace Wine Route is located in the Grand Est region of Eastern France, near the borders of Germany and Switzerland. In fact, over the centuries, the French and Germans have had alternating control, allowing both cultures to shape the region, creating something incredibly unique. If you are wondering why you should explore the Alsace Wine Route by car, here’s one big reason: the entire wine-themed journey is long. Depending on the roads you use and the cities you select, you could travel 170km to 250km. If you want to get from one end to the other and still have time to explore, this might not be the ideal trip to take on foot (or even on a bike). While there is a train connecting two of the larger cities on the Alsace Wine Route – Strasbourg and Colmar – using this transportation option means missing many of the other towns along the way. While you could certainly make a trip of Strasbourg and Colmar alone, the train makes exploring the entire region harder to manage. Plus, when you drive the Alsace Wine Route, you control the pace. You can spend as much time as you want in each village or city, which isn’t something you can always do if you join a tour group or rely on other forms of transportation. Ultimately, exploring the Alsace wine route by car makes handling the distance easier and gives you an exceptional amount of control over your pace. If you want to visit the region on your terms, it truly is the best way to go. Don’t have a car? No problem; you can rent a car in Strasbourg when you arrive by train or plane. Search for the best rates here. One could easily spend weeks exploring the Alsace Wine Route, shifting between cities and villages to their heart’s content. However, most people don’t have that kind of time, so it makes sense to focus on some of the best Alsace Wine Route destinations instead. 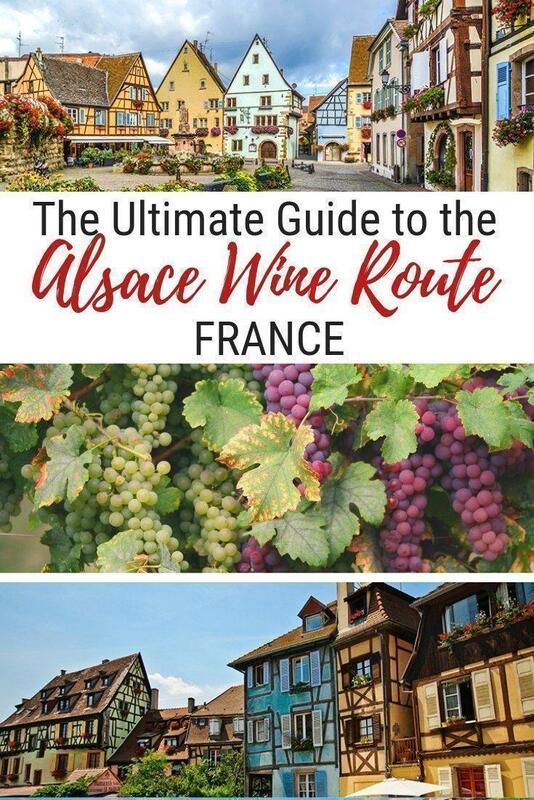 If you want to know which cities should make your Alsace wine route tour itinerary, here are four that should be on everyone’s list. 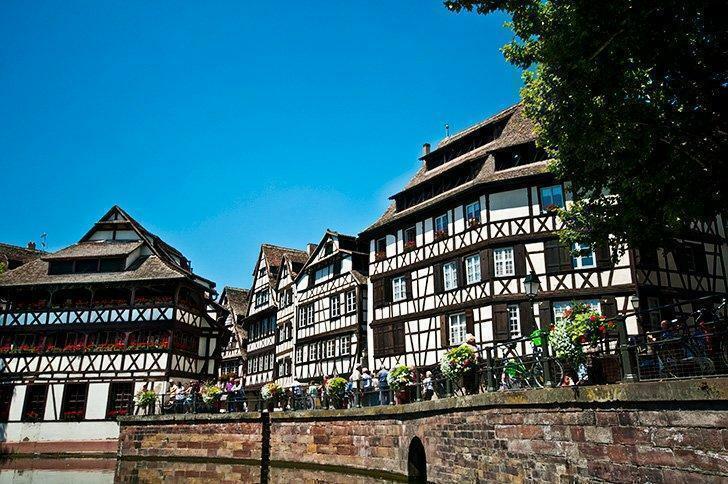 A UNESCO World Heritage site and capital of the Alsace region, Strasbourg is a great starting point for your Alsace Wine Route itinerary. Along with the fantastic architecture – featuring white timber-framed buildings, colourful floral displays, and even a pretty-in-pink gothic cathedral – you certainly don’t want to miss the wine here. For a somewhat unique wine experience, head to Cave Historique des Hospices de Strasbourg. The location was founded in 1395 and is renowned for its fabulous wines. There is even a barrel there from 1492, which carefully holds one of the oldest known wines in the world. Colmar is known as the Capital of Alsatian Wine. 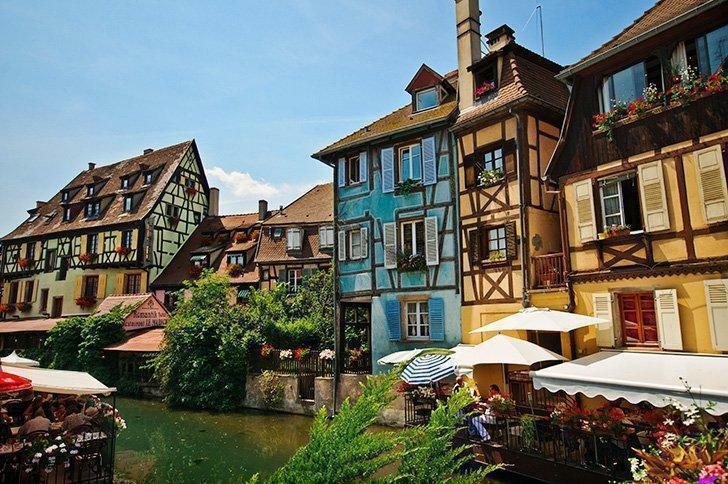 Considered the “Capital of Alsatian Wine,” Colmar features colourful timber-framed buildings, canal-side dining, quaint gift shops, and, of course, wine. In many ways, it is the Alsatian version of Bruges, and it is amazingly beautiful. While Colmar is a popular tourist destination, making it more crowded than some cities on the Alsace Wine Route, you can find peace by strolling away from the main streets and exploring the residential areas near the canal. However, don’t skip the covered market if you want to experience some of the amazing tastes of France during your trip. Plus, if you head to Old Town, wine tastings are plentiful. During the summer, you may also find wine-related events in Place de l’Ancienne Douane near the city center. The city’s climate is ideal for wine, largely because its microclimate is the second driest in the country, so Colmar should be considered a required stop for any oenophile. Don’t miss colourful Eguisheim on the Alsace Wine Route. 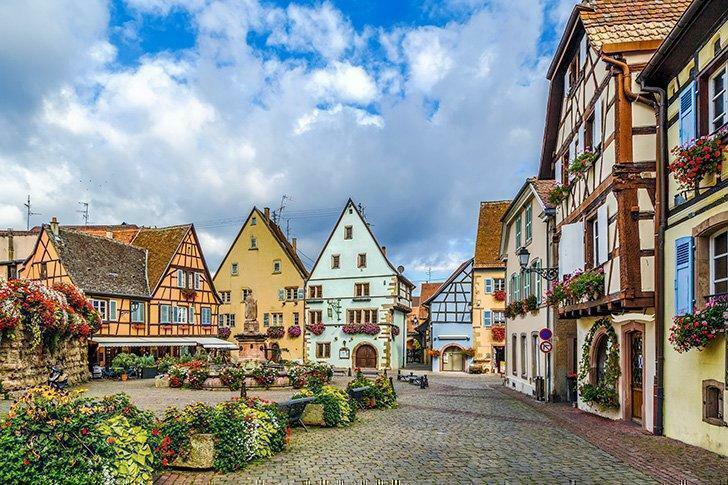 A storybook village along the Alsace Wine Route, Eguisheim is quieter than nearby Colmar. Traditional timber-framed buildings many of them brightly painted, making them playful and vibrant, surround the winding, cobblestone streets. Additionally, the village, which is home to just 1600 people, is considered one of the most beautiful in the entire country of France, especially during the summer when the town gardens are in bloom. Plus, the 8th-century castle, featuring an outer wall that qualifies as a historical monument, dating back to 720 AD, is a unique stop on the Alsace Wine Route. As with every destination on this Alsace Wine Route itinerary, missing the wine would be a shame. Stop into one of the small shops for a tasting. Otherwise, you’ll really be missing out. 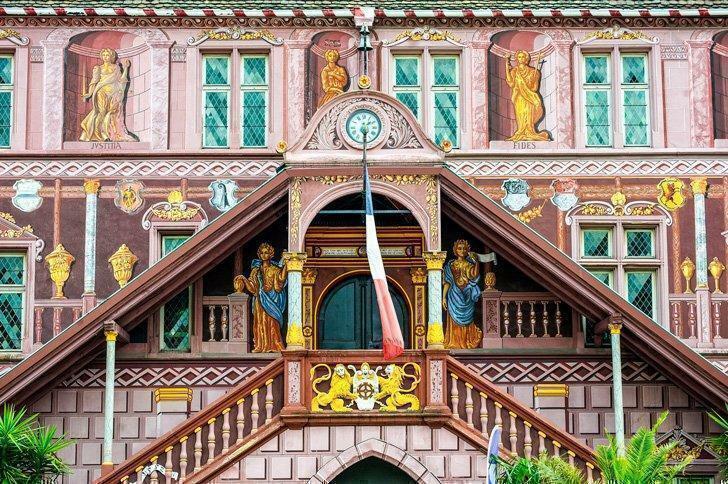 The brightly decorated facade of Mulhouse’s Old Town Hall. While Mulhouse has a bit of an industrial history, it is a fun destination for fans of trains and manufacturing history. The city is filled with museums, including the Cite du Train, which is the largest locomotive museum in Europe, and the Electropolis Museum, which explores electricity in a genuinely unique way. And, of course, wine is plentiful in this city that nestles up to the border of Germany and Switzerland. Want even more stops on the Alsace Wine Route? Read Adi’s article on Three Fairytale Villages in Alsace France. Find the best hotels on the Alsace Wine Route or choose other great types of accommodations. There are numerous hotels in the Alsace wine route, many of which are happy to welcome visitors who are exploring the wines in the region. Precisely where you want to stop may depend on how long you want to explore each city. However, here are a few worth exploring as you plan your trip. If you want to splurge a bit when you start your trip in Strasbourg, this hotel at the city center is a great option. You are just steps from the cathedral and the 16th-century post and beam homes that make up this 4-star location are exquisite. Inside, you’ll find a combination of traditional styling and modern glamour, making it a wonderful experience. Plus, the service is hard to beat. Check rates and availability here. Budget travellers may prefer to start their trip at Comfort Hotel Strasbourg, a 2-star hotel that is part of the Comfort chain. The location is a bit outside of the city center but is still incredibly convenient thanks to the nearby tram. The rooms are fairly basic, but are clean and feel updated. Plus, there is free wifi and an onsite restaurant, ensuring you can relax and touch base with friends and family. Check rates and availability here. Located near the city center, the Colmar Hotel is an excellent option for travellers who are looking for an exceptional experience. The staff is excellent, and the included breakfast can help you get your day started on the right foot. Plus, there is free parking, and many rooms come with a complimentary bottle of local wine. What’s better than that while you are exploring the Alsace Wine Route? Check rates and availability here. If you would rather stay in nearby Eguisheim instead of Colmar, consider La Grange de Madeleine. This apartment option is incredibly well-appointed, giving you everything you need to be comfortable, including a small kitchen area, dining table, and more. It is also right next to the site of the Eguisheim Christmas Market, making it ideal for a winter trip. It is a bit of a splurge, but visitors are never disappointed by La Grange de Madeleine. Check rates and availability here. For a comfortable room and a welcoming staff, Kyriad Hotel Mulhouse Centre is a great option. The interiors feel very modern, but also feel cozy. Plus, the included breakfast is a nice addition, and it is an amazing value. Check rates and availability here. Catherine Reed is our token American. Growing up in a military family, she had the opportunity to become a world traveler at a very young age. In total, she has spent time in 26 states and more than a dozen countries. She loves to explore local cuisines and unique landmarks, particularly those that relate to the darker side of history. 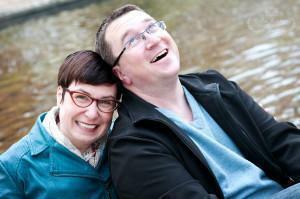 She is a passionate writer and tech enthusiast, and currently calls Washington State home.